1. Mix the red chilli powder, cumin powder, pepper powder and turmeric powder. 2. Keep aside in an airtight jar till required. 4. Fry the onions till soft and add the tomatoes. 5. Mix 1/2 tsp of the mixed masala powder (step 1) with little water. 6. Add to the pan and simmer. 7. Add the beans with remaining water and cover pan with a lid. 8. Simmer on low heat for 5 to 10 minutes. 9. Add coconut and lemon juice. 10. Remove the lid and simmer until thick and vegetables are cooked. 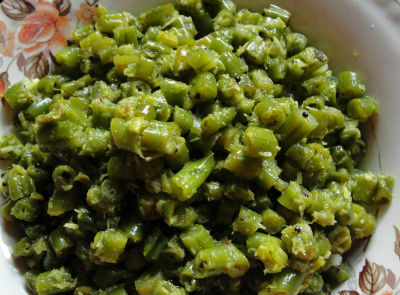 Feel free to comment or share your thoughts on this French Beans with Coconut Recipe from Awesome Cuisine.